I met up with Reginald at Subculture Coffee in between his gigs on a humid Thursday afternoon to find out more about his sax affair. It's pretty impressive that he has built a full time music career in such a short time. On a recent Sunday at the downtown Hilton Hotel, the scene was hopping. A Baywatch party was the theme, though South Floridians need no excuse to get into swimsuits and get in the water. A new brunch menu at the café that overlooks the pool area that featured steak and egg burritos, seared tuna salads and Nutella French Toast hit the spot. The real action was out around the pool, where a DJ was pumping out tunes for the crowd and a real treat was the handsome green-eyed saxophone player weaving magic melodies along with the DJ mix. The unexpected sound created a hypnotic spell for the crowd, at one point he was floating in the pool in a giant flamingo blow up float while playing. Now that’s something you don’t see or hear every day. 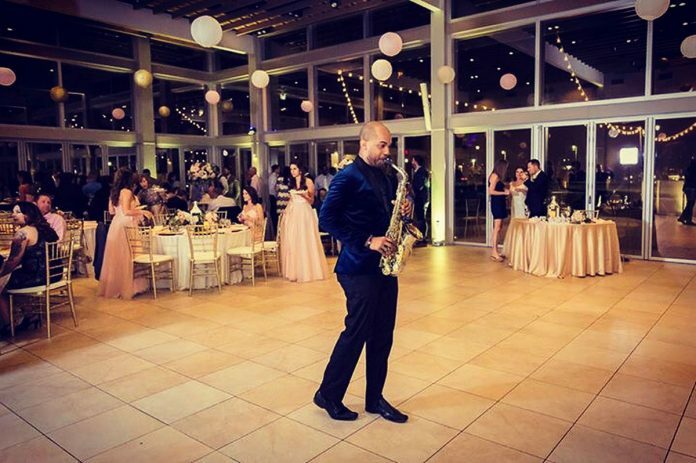 The sax player is Reginald Ellison, 31, a South-Florida based saxophonist. Born and raised in Ft. Lauderdale, he began playing the saxophone at the age of 10 in his school’s band and has been playing ever since. I met up with Reginald at Subculture Coffee in between his gigs on a humid Thursday afternoon to find out more about his sax affair. Realizing that forming a band was a difficult project, Reginald decided to just figure out a way to “play for as many people as I could”. That meant booking himself solo in all kinds of venues and functions including weddings, church events, guesting with other bands and playing cafes in all South Florida’s three counties. The unique gig he made for himself involves playing along with the house DJ at weekly shows now at the Hilton and at the happening brunch spot Salt7 in Delray Beach on Atlantic Avenue where a recent Sunday found Reginald playing to a packed house of partying hordes downing Mimosas and omelets while dancing on table tops. Considering Reginald has only been doing this for 2 years, it’s pretty impressive that he built a full time music career in that time. I ask him why he thinks his sound is resonating with people. He’s also been playing cruise ships, a cushy gig that lets him travel to the islands and make even more great contacts on luxury big ships. With that Reginald checks his watch and realizes he’s got to jet to his next gig appointment. Catch him at one of his next weekend shows.